Find easy ways to decorate your driveway. 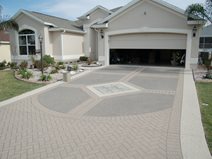 Your decorative options for existing concrete driveways are nearly as broad as those for newly placed driveways. As long as the concrete is in sound condition, it can be colored, resurfaced, saw cut or engraved to achieve a multitude of patterns and color schemes. More and more contractors are specializing in making over existing concrete in response to consumer desires to save the money and hassle of complete driveway removal and replacement. This approach has also become more popular because it's environmentally friendly and conserves resources. After all, why replace perfectly sound concrete when it can be given a facelift that will extend its service life for decades? At the same time, you'll be enhancing the curb appeal of your home and boosting its resale value. 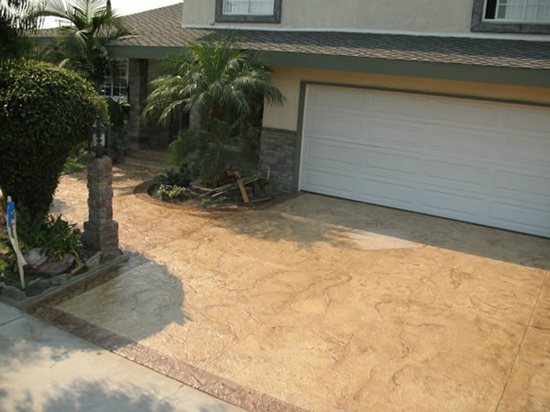 Use the links below to get ideas of the decorative concrete applications that can be applied to existing concrete driveways. Often the best looks use a combination of these techniques, such as staining and engraving or resurfacing and sawcutting. Many contractors have become masters at blending various colors of stain to create realistic faux finishes that mimic real stone or brick. If you resurface an existing driveway with a stampable overlay, you'll also be able to choose from the same vast array of stamp patterns available for newly placed concrete. A combination of concrete stains, antiquing colorants, decorative sawcuts, and texture stamps were used to transform this home's driveway and entryway. This colored concrete driveway was streaked and faded due to weather exposure and improper maintenance. Water-based stains in the colors of brown and light adobe were used to revive the original color, followed by the application of a sealer to prevent future fading and discoloration. 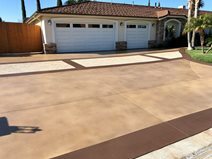 A combination of faux finishing with water-based stains and custom engraving revived this plain gray concrete driveway, giving this home instant curb appeal. The pattern for the brick border was created with a custom template. 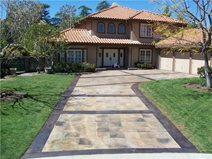 See how a contractor transforms existing driveways by using adhesive-backed stencils and concrete overlays. The stencils come in a variety of stone, brick, cobblestone, and tile patterns as well as special accent designs, permitting a wide variety of looks. 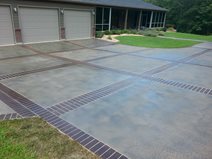 This driveway makeover is the perfect example of how you can use concrete stains and overlays to completely revitalize existing concrete. The color of the original concrete had become faded and blotchy over time. 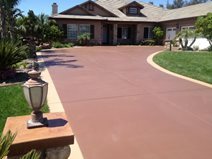 The application of solid-color water-based stains, in colors that complement the home exterior, gave the driveway new life. One of the easiest ways to transform an existing driveway is to cut decorative patterns into the concrete. On this project, sawcut borders and a square design were used to create a tile pattern, and then acid stains were applied to create the look of individual tiles.